They're low in sodium with just 15mg (1% DV) of salt. They're a good source of fiber with 5g (20% DV) of fiber. They contain at least 3 added sweeteners: glucose syrup, honey, and sugar. Sweeteners improve taste and are okay in moderation. However, sweeteners also add unnecessary calories, often make you hungry, and raise your blood sugar. They contain at least 2 potential allergens: almonds and soy lecithin. They contain refined grain flour (rice flour) instead of a whole grain equivalent. Refined flour is usually less nutritious than the whole grains its made from. In addition, flour generally raises your blood pressure more than whole grains. Are Almond & Apricot KIND Bars vegan-friendly? No. Almond & Apricot KIND Bars are not vegan-friendly because they contain honey. Are Almond & Apricot KIND Bars gluten-free? Yes. Almond & Apricot KIND Bars are gluten-free. All 10 ingredients are gluten-free. Are Almond & Apricot KIND Bars dairy-free? Yes. Almond & Apricot KIND Bars are dairy-free. All 10 ingredients are dairy-free. Are Almond & Apricot KIND Bars keto friendly? No. Almond & Apricot KIND Bars are not keto friendly because they contain apricot, glucose syrup, honey, chicory root fiber, rice flour, and sugar. Are Almond & Apricot KIND Bars lactose-free? Yes. Almond & Apricot KIND Bars are lactose-free. All 10 ingredients are lactose-free. Are Almond & Apricot KIND Bars paleo? No. Almond & Apricot KIND Bars are not paleo because they contain glucose syrup, rice flour, soy lecithin, and sugar. 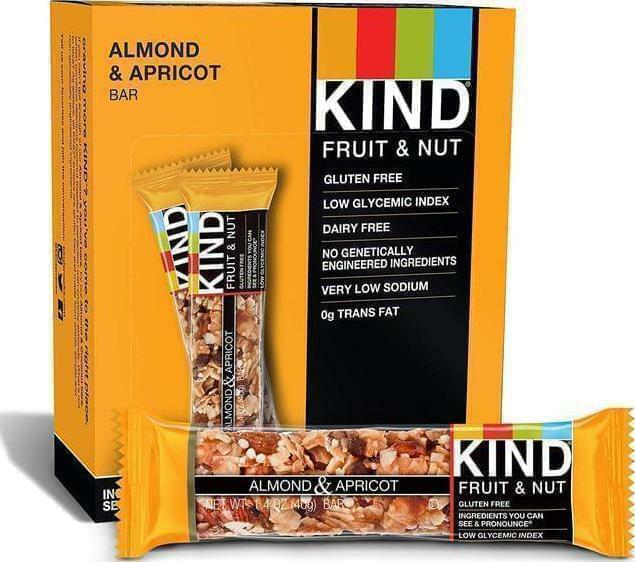 Almond & Apricot KIND Bars are made by KIND Snacks.